StarMark's Swing n Fling Durafoam Fetch ball is great to tug, shake chew and toss. Even floats in water. Designed for interactive play, it is made from Starmark's patented durafoam material making it more resistant to chewing while being soft on the dog's mouth. With no cover to chew off, it's much safer than a tennis ball. 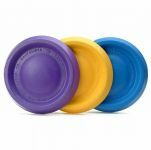 The Swing n Fling Durafoam Fetch ball flies far, is fun for you to throw and is easy for your dog to retrieve. 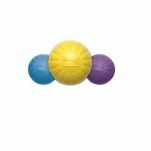 Read 9 customer reviews of StarMark Swing n Fling Durafoam Fetch Ball. The average customer rating is 4.6. Fantastic product great for retrievers. My dog loves it. It has become his favourite toy. I have a mastiff so very large but gently dog and this is a very sturdy toy that works well in the water for him. Great product - very popular with my four Golden Retrievers! This ball is very strong, and bright so it can be found easily. What I like most though is that it is very light. Some balls are very dense and would probably hurt my dog if I aimed badly. We have now had about 3 of them, and the only reason we've had to replace them is if my husband has accidently thrown one over someone's fence and lost it. Thanks for such a great product. We found the StarMark Swing n Fling ball absolutely great! Our dog Leo (who is a Boarder Collie) loves it. He plays with it in the river, beach and backyard. The bright colours make it easy for both him and I to see in the wateror grass, it floats all the time (unlike tennis balls that have been chewed to many times), the attaché rope means you can throw it a twice the distance of one of the standard tennis ball stick chucking things, and your dog is able to find it even when it gets coated in sand! If you want to give yourself and your dog a great workout then get this toy, our dog loves it so much he even sleeps next to it. It is durable and a great price too. 10 out of 10. I am not that impressed with the Swing & Fling. The quality is not there, and my pup has already started to put 'pulls' in the rope, as well as chew through what I think is shrink wrap. 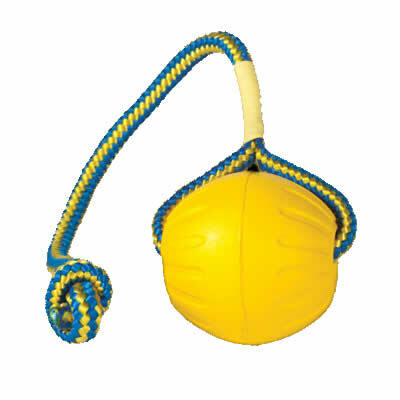 I have a similar product already, and love the concept of the floating ball and rope, I just think that the rope quality could be improved. Cooper, my goldie, and his mates are having a pawtastic time with this toy at the beach. We would recommend it to anyone, especially those who have water dogs.